Last week I had the chance to visit Grand Forks, North Dakota, and give a talk on the subject of “Setting the Stage for St. Paul’s Corinth: How an Isthmus Determined the Character of a Roman City.” It was great to visit Grand Forks and the University of North Dakota especially as the weather was so pleasant. Thanks to Bill Caraher, the Department of History, and the 2010 Cyprus Research Fund for sponsoring my visit. The crowd that came out asked a round of great questions about the environment, religion in Corinth, and the nature of ancient evidence. The full talk was recorded as a podcast that is available here. First, when thinking about a city like Corinth, and St. Paul’s community there, it is important to not dwell in the urban center alone. If territory was always important for ancient cities, it was especially significant for Corinth. Ancient authors consistently discuss Corinth in terms of the concentrated economic exchanges across the landscape and especially in the ports and the biannual fair at Isthmia. Kenchreai, Lechaion, and Isthmia were important bustling places in the landscape and integral to the regional economy. It is surely not mere coincidence that we hear of Kenchreai developing its own separate church community with a famous deaconess named Phoebe. Second, archaeology has demonstrated how important is a regional framework for understanding Roman Corinth’s economy. The urban center, the sanctuary at Isthmia, the lands, the scattered villas and farms across the Isthmus created an integrated economy of production and exchange that constantly interlinked the city center, suburbs, and seascape together. Archaeological investigations in town and country have shown that the Corinthia was more connected to markets than many other regions of the eastern Mediterranean. 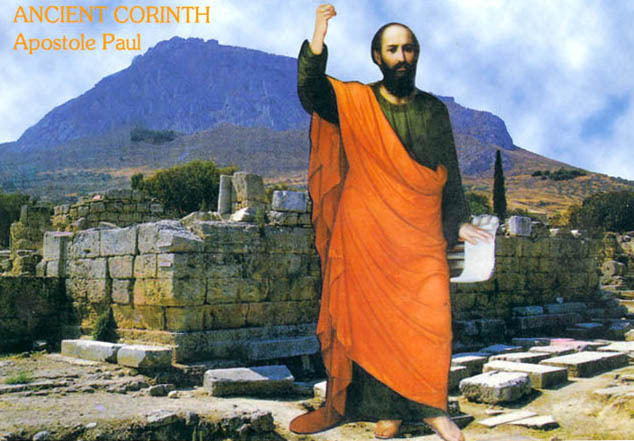 This ‘connectivity’ and orientation to markets provides the backdrop to understanding both the literary anecdotes about Corinth and Paul’s community in crisis. Third, the Corinthia was a place to which people voyaged, not simply a region that people passed through. People visited the Isthmus for a variety of reasons, not least of which was to conduct trade and business. This may well have been a motivation for St. Paul himself who knew that here on the Isthmus he would meet bustling crowds associated with the market places, the tourist sites, and the Isthmian games. It was a pleasure meeting you this great for UND to have such an expert here to discuss St. Paul on the Isthmus. Dr. Pettegrew and Dr. Caraher are very knowledgable and have fascinating conversations. (IT guy who recorded the session). And you as well. Thanks again to you and Caleb for making the podcast and video happen for us. I was happy that it all worked so smoothly. I bought that postcard of St. Paul in 1977! I can’t believe they are still selling it. I think I bought mine in 1999 but I know I’ve seen it in more recent years. Better buy a new one while I can!